A few months ago my daughter and I were out on a hike at a state park and I found this spike on the ground. It was pretty close to the parking lot so kind of surprised no one had picked it up before and while it its certainly patina’d I don’t think its truly that old (but maybe it could be). Now that I’ve got it I have no idea what to do with it. At first I thought a handle on a drawer or door, but I don’t have any projects like that planned and don’t have much in terms of metal working tools to be able to adapt it. Right now the best I have as an idea is a piece of shadow box wall art using various species of lumber (like my night stand) and then putting the nail on it. I don’t hate the idea, but don’t love it and am hoping someone else can lend a bit of inspiration. 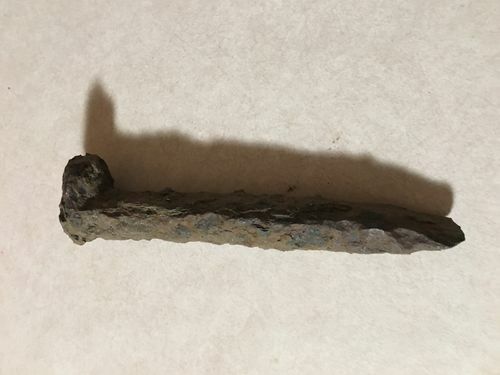 Railroad spike. Could be any age since they stayed basically the same for decades. That one is probably from the late 1800s. Those spikes are made of some tough stuff and takes a long time to get that much rusted away. You can use it as a show piece, or grind a new chisel end on it and use it as a chisel. Coat / hat/ stuff hook? I just salvaged 5 off a job myself. 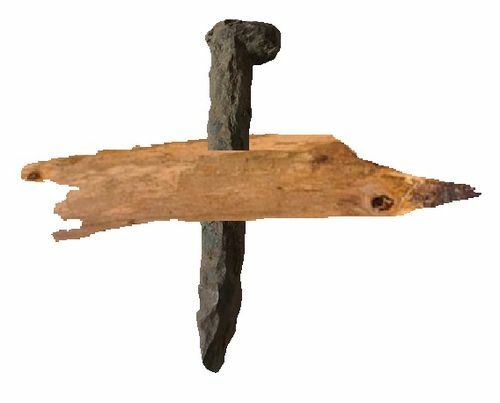 Old railroad spikes are fairly easy to find along tracks as they don’t always retrieve them after replacement with new ones. I have found several but never thought of keeping them as collectors items since they are pretty common. Like someone else said, that sample is probably quite old because of its condition. I have also found several short segments of track at different times but, regrettably, I didn’t save them. They make an excellent alternative to an anvil for doing metal work. Tie a rope to it and wear is as a talisman. Might come handy if your train gets delayed because the railroad maintenance crew are short one spike. Come out forward like a hero and pass them your treasured find! A few months ago my daughter and I were out on a hike at a state park and I found this spike on the ground. It was pretty close to the parking lot so kind of surprised no one had picked it up before and while it its certainly patina d I don t think its truly that old (but maybe it could be). Now that I ve got it I have no idea what to do with it. At first I thought a handle on a drawer or door, but I don t have any projects like that planned and don t have much in terms of metal working tools to be able to adapt it. Right now the best I have as an idea is a piece of shadow box wall art using various species of lumber (like my night stand) and then putting the nail on it. I don t hate the idea, but don t love it and am hoping someone else can lend a bit of inspiration. It was probably still laying there because most parks say it’s illegal to bring out anything you didn’t bring in. where I live it’s even illegal to take a small piece of driftwood off the beach. I think you can use it to kill Jason like on the Friday the 13th movies.